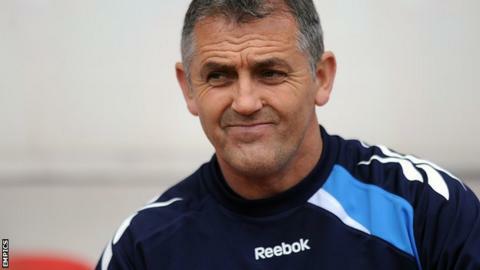 Owen Coyle has said he is yet to receive an offer that would tempt him back into management. Reports on Friday linked the 46-year-old, who with the vacancy at Blackpool. "There's been a few things I've been approached for but nothing has taken my fancy," Coyle told BBC Radio 5 live. "If the right offer came along tomorrow, I would take it, but it's got to be right for me in terms of having the same ambition as I have." The Scot, who did not comment specifically on the job at Bloomfield Road, continued: "I've been very fortunate with who I've worked with at Burnley and Bolton. That's a big part of it for me. I need to know I'm working with the right people. We've seen in football lately that it's not been the case with one or two managers." Blackpool are in the process of looking for their third manager of the season, following the departures of in November and then after he had spent just 65 days in the role. Steve Thompson is currently in caretaker charge of the Seasiders. Coyle took over at Bolton in January 2010, six months after guiding Burnley to promotion to the Premier League and consequently signing a contract extension at Turf Moor. The Trotters went on to survive a relegation battle, while Burnley went down. In 2010-11, Bolton reached the last four of the FA Cup and finished 14th, after spending much of the season in the top half of the table. But last season he could not save Wanderers from relegation, ending an 11-year spell in the top flight, and departed in October with the club struggling in the Championship.